She is 76 feet of floating luxury. Ferretti yachts are designed with speed and comfort in mind. SHERILYNS interior is luxurious and functional, her 4 ensuite cabins are spacious and well-appointed and her layout is suited to any type of function. She is equipped with everything you could desire for a luxurious charter in Cape waters. She is moored at the V&A Marina, which is situated in the middle of one of the most sought after real estate locations on the African Continent. When chartering SHERILYN you will experience the lifestyle of the rich and famous. Her interior is designed to the highest standards, with walls clad in cream nappa leather, her furniture is a combination of polished wood and cream leather, her cabins are spacious and well appointed, her layout is suited to any type of function and she is equipped with everything you could wish for a luxurious charter. 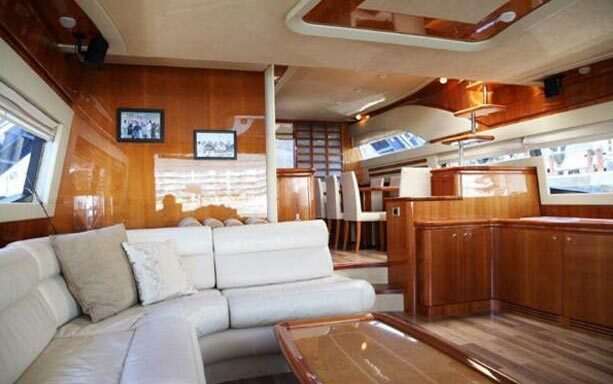 Motor yacht SHEIRLYN offers various areas for guests to relax and enjoy the ambiance. The aft deck is the ideal area to dine alfresco and enjoy the delights from the galley. The fly bridge is the perfect place to enjoy sunset cocktails and all day fun relaxing on the sunbeds. Her 2x 1420hp engines can propel her along at 37 Knots. She is also fitted with anti-rolling gyros, exclusive to Ferretti to make the experience even more pleasurable. Cruise from the Cape Town V&A Waterfront to Clifton bay (also known as the Monaco of South Africa) which is the ideal place to spend a few hours at anchor onboard Motor Yacht Sherilyn, enjoying the sun and a swim in the cool water. A maximum of 20 passengers. We recommend a windbreaker jacket, non-deck marking shoes (eg trainers/deck shoes, no black soles), sunglasses and sun lotion. On arrival you will be met by fully trained crew as well as complimentary welcome drinks and light snacks. Full crew and fuel. Exclusive use of the yacht. Crockery and cutlery. Catering - various menu options for the snacks & cocktail dishes / platters are available, to be confirmed in advance. Alcohol / soft drinks – a list needs to be provided, to be confirmed in advance. Bringing your own drinks and snacks is permitted. DJ / Entertainer - We have numerous DJs on our supplier list and are happy to facilitate that for you. Cape Town based singer/Entertainers details available on request. Add this unique trip onto your yacht charter. Experience one of the most unique features that the Mother City has to offer, snorkeling with Cape Fur Seals in Cape Town. We offer the most comfortable and luxurious dive package together with your luxurious yacht cruise. The luxury dive package includes 2 x dives, full equipment rental, dive guides, MPA (Marine Protected Area) diving permit). Fruit, biscuits & water are served in the surface interval. After diving a light snacks will be served.